Terri Malec, a Virginia native, was educated in the Fine Arts at Virginia Commonwealth University, Richmond; and Maryland Institute College of Art in Baltimore. Great, great uncle WW. Denslow, famous illustrator of the Wizard of Oz books, was the hereditary link and inspiration for her artistic talent. Growing up with his books and family stories from her grandmother, she wanted to become an artist, and spent much of her spare time drawing her favorite subjects: horses and dogs. She also penned and illustrated several childrens books during her teenage years. The allure of the west eventually drew her to the Pacific Northwest of Oregon and Washington. She began a journey to capture its abundant wildlife in paint and bronze sculpture. Over the years, while raising three children, and numerous pets of all descriptions, living in Joseph, Oregon, Anacortes, Washington and the Virginia hunt country, Terri was captivated by the wildlife of those beautiful areas. She took her observations in the wild to the studio where she focused on movement and expressive personality of her subjects. An avid bird watcher, Terri's avian subjects are graceful and colorful, and she tries to bring the feel of the fields and marshland to each sculpture. Her birds reside in gardens, pools, and places of honor in collectors homes. Herons have been a popular, recurring subject, and they abound in her work over the years. 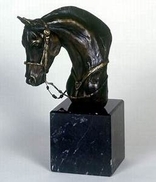 Equine subjects are still a passion and sculptures of galloping horses with flowing manes and high spirits have been consistent in her work; as well as commissioned portraits of champion horses have been a popular and sought after subject. She draws much of her inspiration from owning and riding her own horses, which she keeps on her small ranch in Joseph, Oregon. "Must love dogs" is still a major part of her life, and canine sculpture of many breeds, and collectors beloved pets, have been a continuing theme in her work. Commissioned sculpture re-creating "special and beloved" pets has been a very rewarding adventure, working with both owner and dog to eventually come to life in bronze. In addition to her animal and avian sculpture, religious art commissions have followed Terri throughout her artistic life and have come to grace many churches nationally. These devotional icons and sacred subjects, bring a deeper spiritual experience, and enhance Catholic parishes, grotto's and gardens, as well as private homes. Malec's sculptures are part of permanent and corporate collections as well as Museums throughout the country including, the Leigh Yawkey Woodson Art Museum, Wisconsin; Colorado Historical Museum, Denver; MBNA Headquarters, Maine; and St. John the Beloved Catholic Church, Virginia. 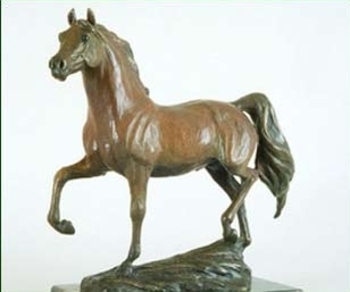 Special exhibits include "Birds in Art", "The American Academy of Equine Art" and "Animals in Art". Her award- winning sculpture has been juried into many exhibitions nationally and internationally. Terri also continues to teach sculpturing classes through national workshops and community colleges. She is a member of The Society of Animal Artists. Terri Malec's sculpture is currently available through Valley Bronze Galleries, Astoria and Joseph, Oregon; Howard/ Mandville Gallery, Kirkland, Wa., Scott/Milo Gallery, Anacortes, Wa., and The Outdoor Inn, Manteo, NC. Terri Malec has been a instructor in national sculpting workshops in Alaska, Yellowstone Park, and Maine with the "Ultima Thule" Wildlife Workshops. Her on-location methods of "sculpting in the field to the studio" brings an exciting aspect to her classes. From wolves in Alaska to buffalo in Yellowstone, she takes a class to the wildlife for an upfront and personal approach. She also has taught through the Lord Fairfax Community College in Virginia for several years. Classes held in the Frederick Hart studio in Virginia, were a dramatic and inspiring location for figurative and portrait summer workshop classes. "Equine" sculpting workshops are also taught using one of her two horses as live models. Sculpting classes are held at her Marysfield Studio or scheduled on location and through national workshops.